Contact Agency Need help with a question? Ask us directly. Striking design and custom furnishings feature throughout, while family-friendly extras include a huge kids' play area/bunkroom, and a 27-metre infinity pool with a shallow area. 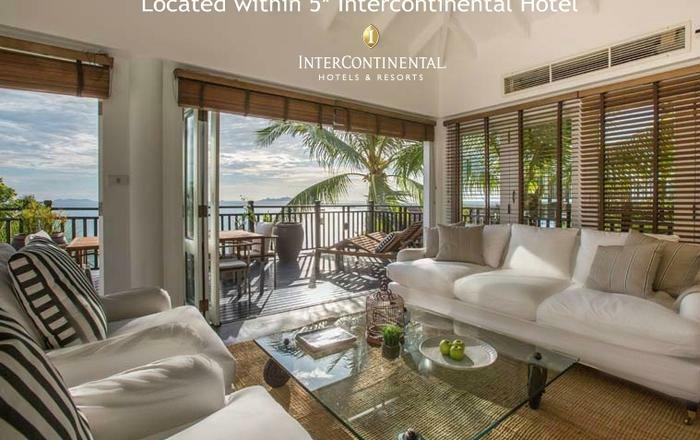 Guests also have a resident Thai Chef, a continental or Chinese breakfast, and three sea kayaks. Sleeps 12 adults and 6 kids. Roll back the windows in a light-filled living space and welcome in the ocean breeze. Get into the holiday mood and ask the staff to mix you a Mai Tai while you admire the view across the lagoon. When you're ready, take a weight off and sink into the solid wood L-shaped sofa—custom-made by local artisans. A floor-to-ceiling teak library houses a selection of books to inspire your travel plans. There's also a fully equipped media system with a 55" flat screen with Apple TV. Fill your days with music—a fully-integrated sound system has speakers throughout the communal area. In the mornings, the first sound you'll hear is the rolling ocean. (Unless the kids are already splashing around in the 27-metre infinity pool!) 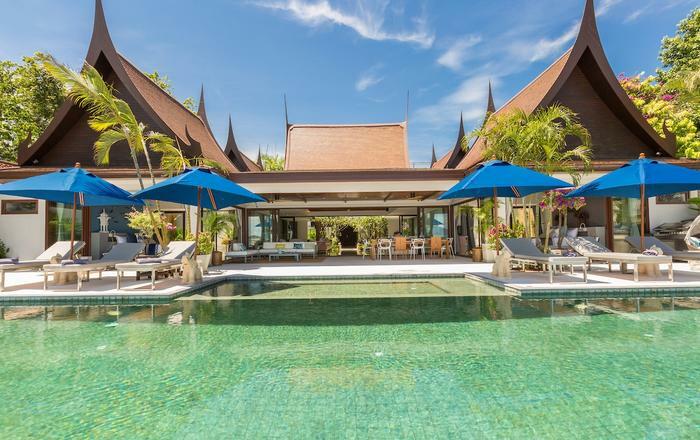 Beyond, a manicured lawn is perfect for morning yoga, a high intensity workout, or Thai kick boxing - all easily arranged with the villa's English-speaking manager. The villa's uber-contemporary kitchen is ideal for preparing light meals and drinks. This fabulous cooking and entertaining space features dramatic black finishes, polished copper lighting, and high-end appliances. A great place to gather. Discuss the day's upcoming adventures over breakfast at the solid wood dining table. Or give in to the tempting sugar-white beach and opt to take it easy instead. 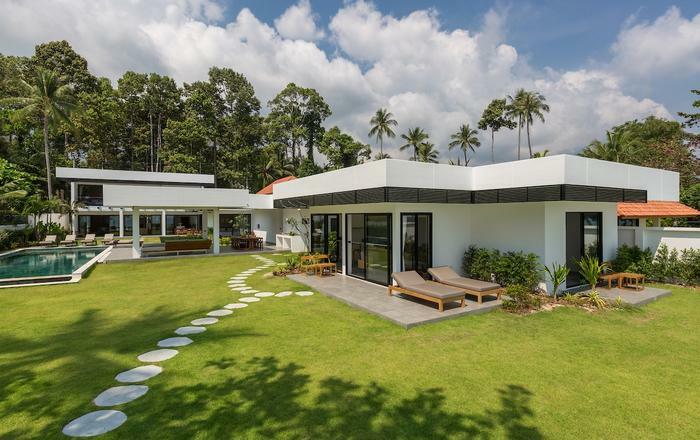 Spread across three separate pavilions, the six bedrooms have a minimalist vibe with honey-coloured teak woods and white terrazzo floors. The poolside pavilion has two bedrooms with pool and lagoon views. One of the bedrooms has a king bed, and the other has two twin beds with an extra pull-out bed - perfect for parents sharing space with children. A garden pavilion has another two bedrooms, with views of the tropical gardens. 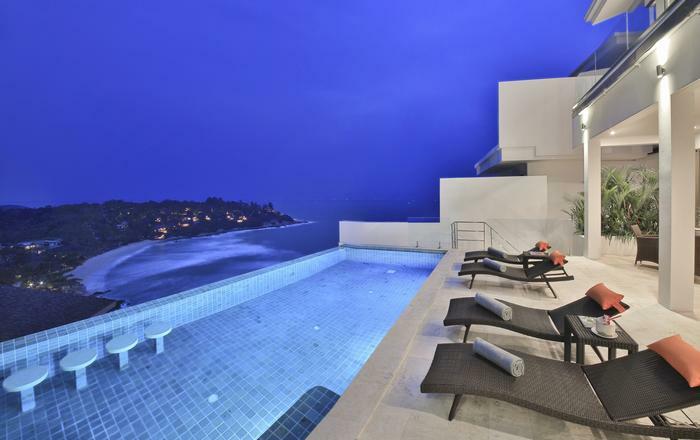 The final two bedrooms offer a private, elevated setting with panoramic ocean vistas. Little ones will love the enormous play area/bunk room situated below. This huge play space sleeps six, with toy-filled shelves and a wall-sized chalk board for creative doodling. Every bedroom includes its own luxury en-suite bathroom, complete with black terrazzo floors, and a rain shower that opens to its own private garden. In the poolside pavilion, the king-size bedroom also offers a beautiful freestanding bathtub. 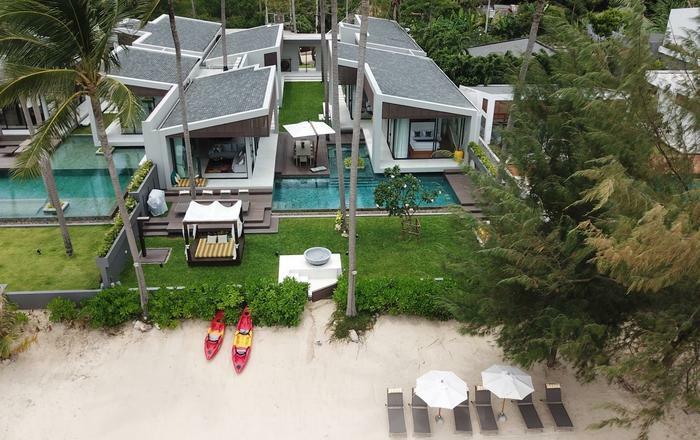 Just 30 minutes from Koh Samui Airport, this stunning villa lies on the tranquil Laem Noi Beach along the north shore of the island, with idyllic views towards neighbouring Koh Phangan. Ready to explore? Take a morning run along the 45-meter pristine beach just steps from your door. Or why not drift along the bay in the villa’s kayaks and paddle boards? A colorful coral reef just a short swim from the beach is perfect for snorkelling. INCREDIBEL, AMAZING, PERFECT, AND BREATHTAKING! I'M BLOWN AWAY! Thank you so much for everything! The villa was amazing, staff extremely friendly and helpful, and everything that was planned ahead was perfectly well organised! The food was delicious and service was great! Best experience ever! Our families travelled to Villa Malouna for a get away together and it was wonderful. We had 10 people and 3 kids and it catered wonderfully for our group. Could have easily catered to more adults and older kids. Some of the children were quite small and the play room was a great relief from the heat during the day with plenty to do, some of the adults liked to stay up late and get a bit rowdy and noise was not an issue for those wanting an early bedtime. If the children were older the playroom would have been a fun place to sleep, stay and play for the trip but would need to be a bit older as separate from the other rooms and parents. 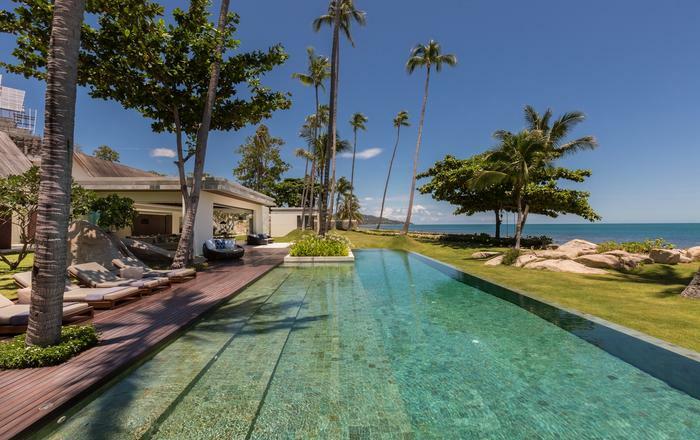 The property is very private and the green space (2 areas), lounge room, pool and beach gives plenty of areas for people to hang out. My only suggestion would be getting a couple loungers perhaps by the pool area for full sun. The staff was very accommodating, the chef was wonderful and villa manager Whan always smiling and helpful. Manager is available to cater for all of your specific needs. Bed linen is changed every third day, while towels are changed as necessary. Pool towels are provided and replenished as deemed necessary. Airport transfers are free of charge as all the guests arrive and depart on the same flights even if two mini-buses are required. If guests arrive or depart at different times the additional charges will apply. 10% service charge and 7% tax. Shopping Service: Prior to your arrival we will send you a food and wine shopping list allowing us to stock the villa with your favourites foods and beverages (on guest's account).10% service charge and 7% tax.